March 02, 2008 Vista Updates Available! Following is a quick tour to the main components of WiFi Hopper. Be sure to check out the Features page for a complete picture of the extensive feature set! WiFi Hopper can display details like SSID, network mode, encryption type, RSSI, frequency and channel amongst numerous others for a complete picture of the environment. It's easy to filter out classes of networks by using the network filters. Additionally, a GPS device can be used for reviewing the approximate locations of the detected access points. With a combination of other features like signal graphing, WiFi Hopper can also be used for additional tasks like detecting channel congestion. Compared to the Windows provided and manufacturer supplied connection managers, WiFi Hopper is significantly more transparent. With its network profile support, WiFi Hopper can remember your networks so that it can automatically connect to them as they become available. Finally, WiFi Hopper also supports a 'Network Hopping' mode in which it automatically connects to open networks in the area. 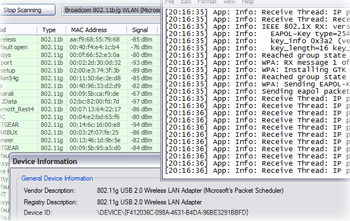 WiFi Hopper can be used to track unsecured wireless networks that may be compromising network security. Additionally, WiFi Hopper makes it easy to look to unauthorized access points involved in an attack or simply causing interference. 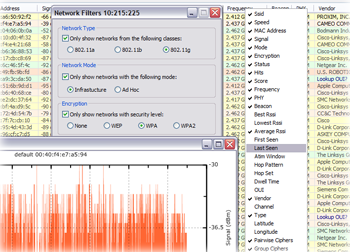 For programmers and QA engineers, WiFi Hopper is the ideal, Windows-NDIS based, testing tool. With WiFi Hoppers connectivity features, functionality of WLAN drivers and hardware can be independently verified.